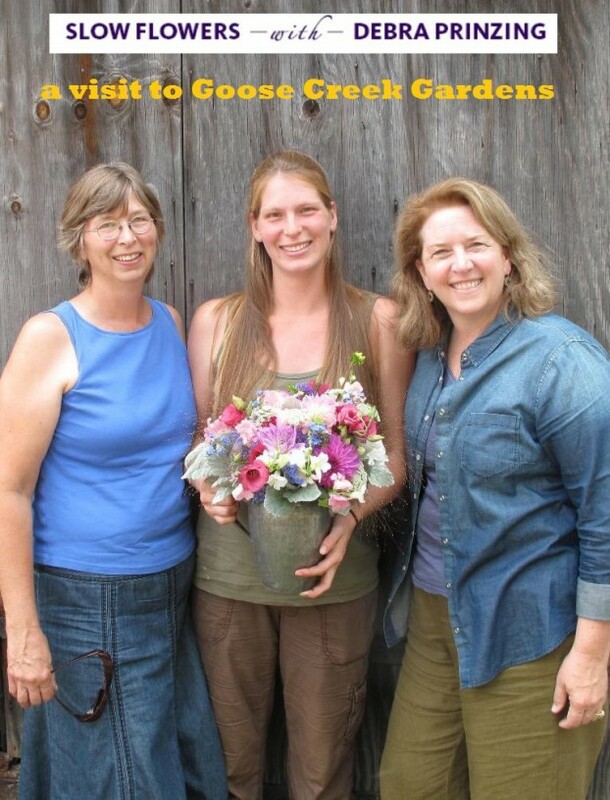 I’m so pleased to share this week’s interview with you, a conversation with mother and daughter duo — Margie Dagnal and Kate Dagnal of Goose Creek Gardens in Oakdale, Pennsylvania, a boutique specialty cut flower farm just outside Pittsburgh. Margie led us on a tour through the farm, including a stop at the Limelight Hydrangeas. 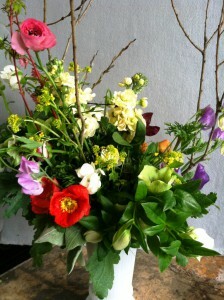 I first met Margie virtually, when she contributed to the Slow Flowers campaign on Indiegogo earlier this year. And then, if that wasn’t enough, she gave me an incredible gift by contributing flowers that two other Slowflowers.com friends Jimmy Lohr and Jonathan Weber of Green Sinner incorporated into a lovely floral arrangement for my Pittsburgh-based publisher St. Lynn’s Press. PS, Jimmy, Jonathan and Margie refused to take a penny from me either. These people are all so generous! 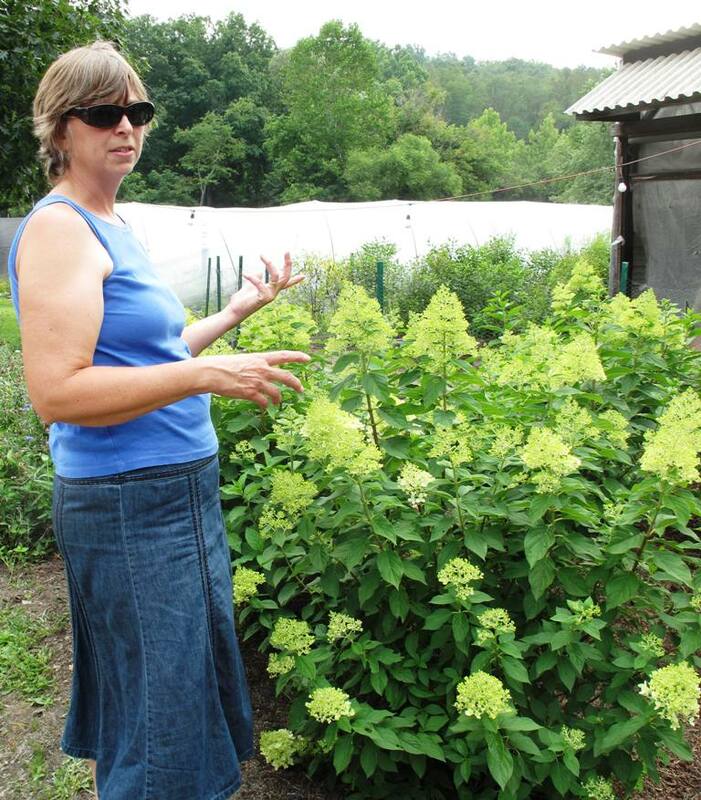 When I visited Pittsburgh in August, I had arranged to spend a morning at Green Sinner, touring the very cool urban cutting garden and floral studio that Jonathan and Jimmy own (you can hear our podcast interview here). Here’s that lovely Green Sinner arrangement featuring Goose Creek Gardens flowers, an Indiegogo “perk” for St. Lynn’s Press offices in Pittsburgh. And lo and behold, Jonathan and Sam Rose, who tends to the Green Sinner cutting garden, offered to pick me up and drive me out to Goose Creek Gardens for a weekend visit. We toured the farm, wandered down to the bottom of the property, along the paths, into the high tunnels and more, all the while chatting constantly about this beautiful bloom and that one. Katie and Margie are super passionate about growing flowers. 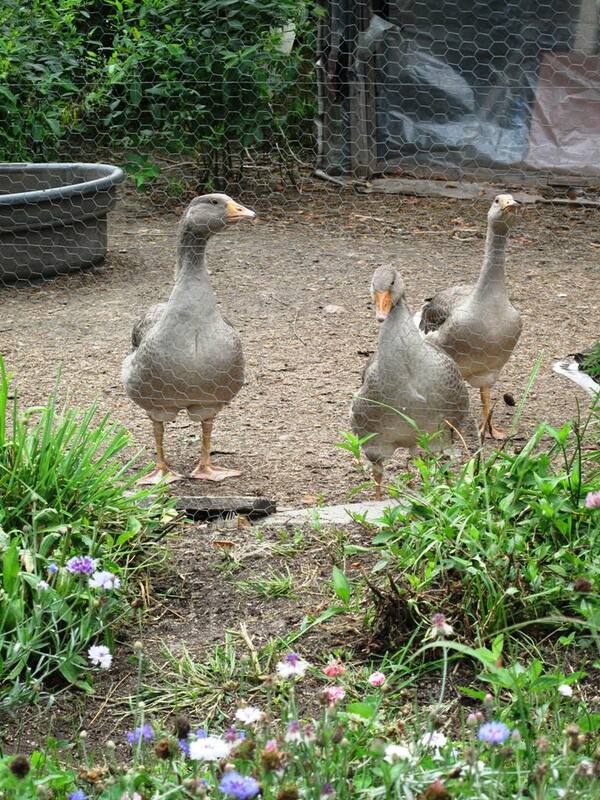 Flowers were once a secondary crop to Goose Creek’s main endeavor – growing veggies and herbs. 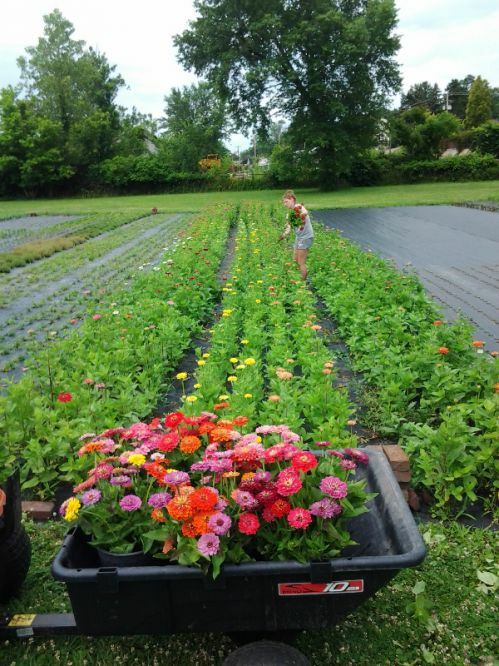 For years, while Margie and her husband Mark, a landscaper, produced salad greens and other delicacies for Penn’s Corner Farm Alliance, young Katie grew flowers. The flower fields at Goose Creek Gardens. 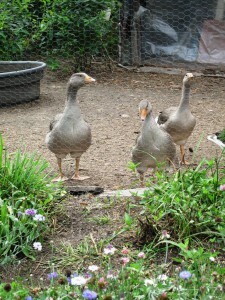 The Geese of Goose Creek Gardens…livin’ the good life! This year, things have changed, thanks to several issues: From pressure on farmers’ market food prices to seasonal flooding that affected some of Goose Creek’s fields, not to mention Kate’s lifelong obsession with growing cut flowers . . . all these incidents gave them several signs to move into flowers 100 percent of the time. 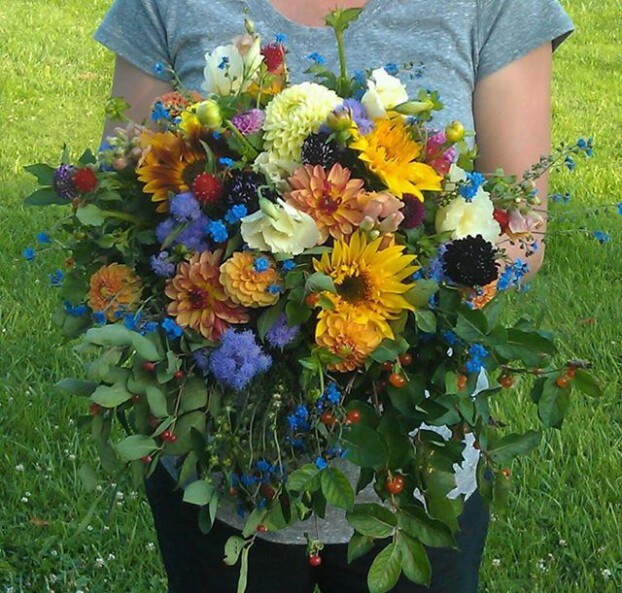 Katie is now a grownup – a young mom who works side-by-side with her parents running Goose Creek Gardens as a cut flower farm. Katie and Margie shared photographs of some of their “Friday Night Romance” bouquets for you to enjoy. 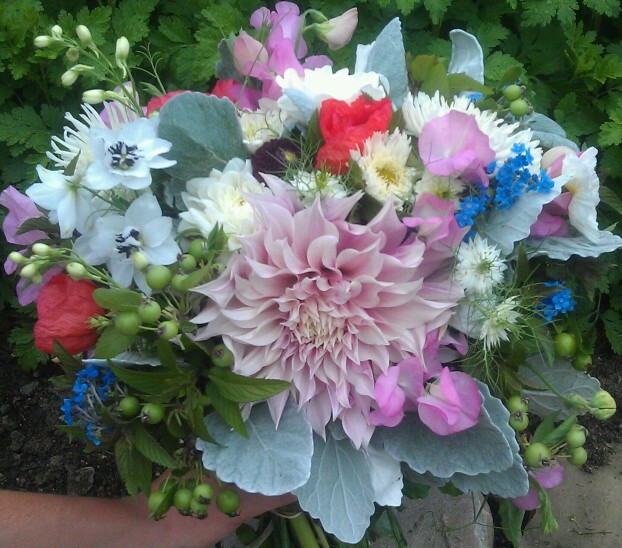 These are part of an ongoing series of bouquets that Katie creates at the end of each week, to share with her followers and other #farmerflorist friends on Facebook and Instagram. I think they are pretty darned romantic – and beautiful! Springtime Friday Night Romance on denim. A lovely dahlia takes center stage. 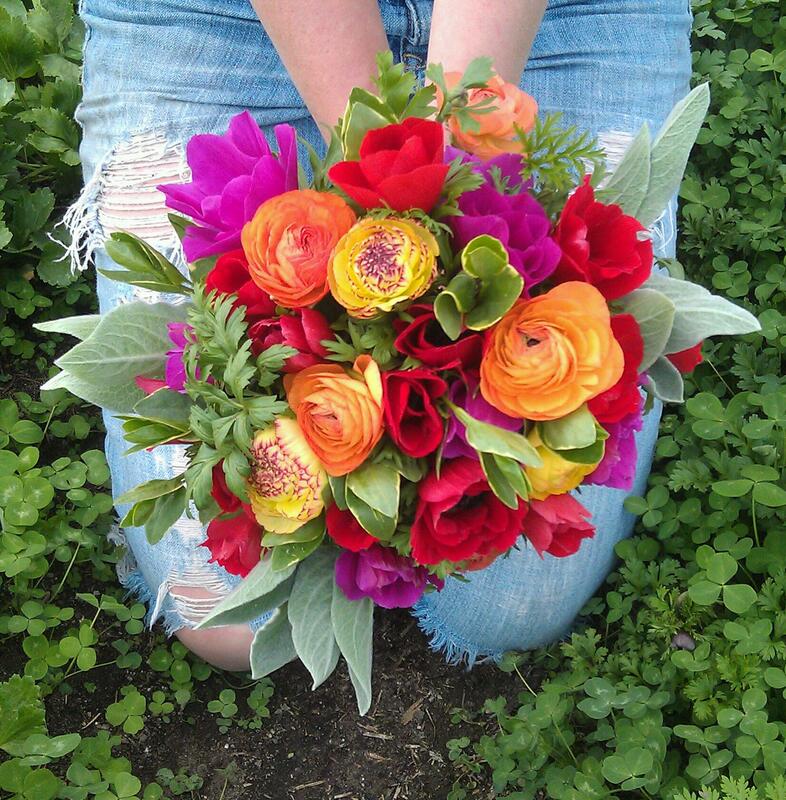 Intense hues add up to a gorgeous Friday Night Romance bouquet. Up next week: a conversation with the inimitable Kelly Norris, who shares his passion – and genius – about a lesser-known category of his favorite flower: The miniature tall bearded iris. Kelly is the award-winning author of A Guide to Bearded Irises and I’m so excited to introduce him to you in a very lively conversation. 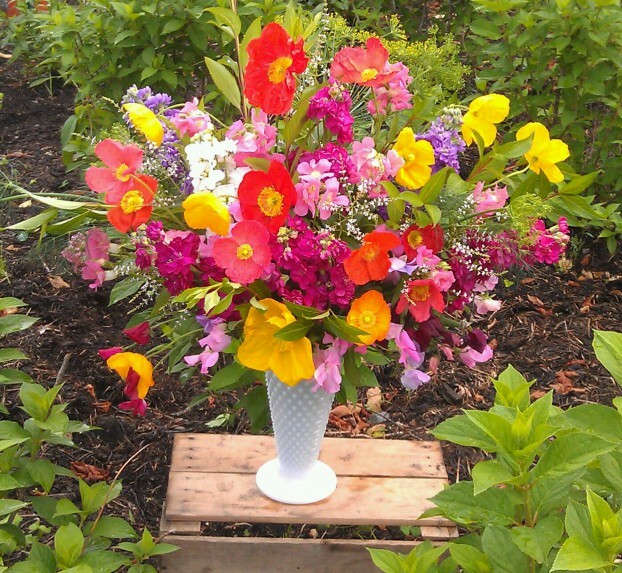 Listeners like you have downloaded the Slow Flowers Podcast more than 21,000 times. If you like what you hear, please consider logging onto Itunes and posting a listener review. My personal goal is to put more American grown flowers on the table, one vase at a time. I promise that when you tune in next week, you’ll hear another insightful and educational episode of the Slow Flowers Podcast. 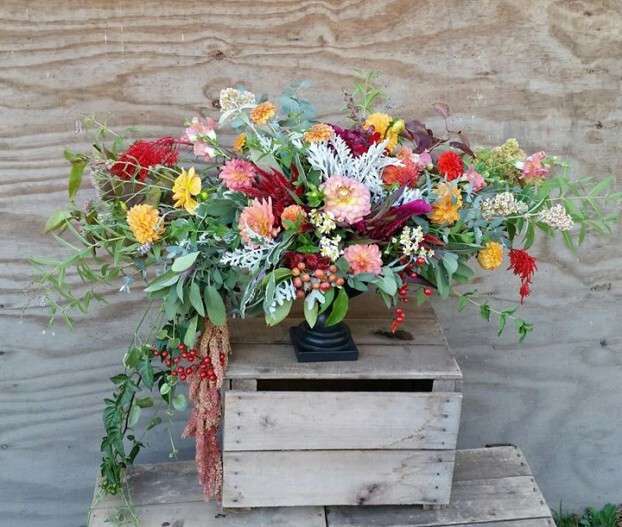 This entry was posted on Wednesday, October 1st, 2014 at 7:10 am	and is filed under American Grown, Blog Posts, Creativity, floral design, Gardening, General, Podcast Episodes, SLOW FLOWERS Podcast, Slowflowers.com the Directory of American Flowers. You can follow any responses to this entry through the RSS 2.0 feed. You can leave a response, or trackback from your own site.